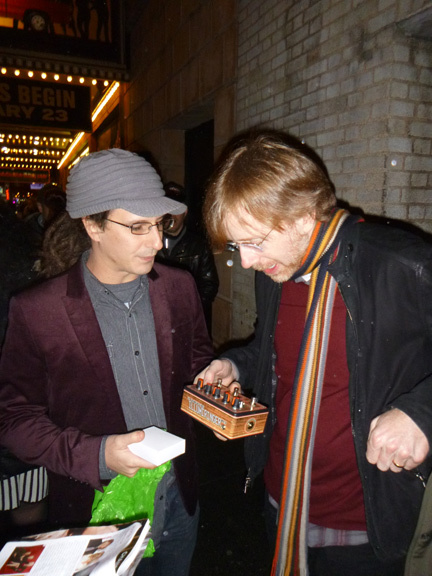 Last night at the NYC premiere of Hands on a Hardbody, Trey Anastasio who helped write most of the music for the play, was hand-delivered a custom designed Illumiringer guitar effects pedal by a fan, Dr. Blankenstein. The pedal’s characteristics are quite extraordinary, with the entire pedal being created with Anastasio in mind — inside and out. Blankenstein worked on the pedal for over a year and explains in detail on Paste Bin what each feature does. Jedi-Trey fans will want to read this. This is the one Trey really influenced A LOT! The motion / light sensor. It is turned on with the middle stomp switch. The actual sensor is located above it. WELL… we have all seen Trey do his Jedi thing with his guitar…he controls the tone with the whammy pedal. I thought “why not be able to actually control the tone with those movements”. A year later… here it is. But it’s better… if you flash a flashlight or laser into it slowly… you can get Theremin style pitch swells. Use a strobe light.. wild oscillations will occur.. control the speed with the flashing. Think of the fun that can happen with a little practice with CK5 ;) Any object that breaks the lights beam to the sensor will change the guitar tone…. more light… wider the range. Read the full explanation of the pedals here and I’m sure Blankenstein will have more to say on his pedal effects site and Youtube Channel. It’ll be interesting to see / hear if Trey incorporates this new tool into his arsenal for Summer Tour. The light beam / tone controlled feature must have had Trey’s eyes as wide as they could go. Can’t wait to find out! Kudos to Dr. Blankenstein for his impeccable timing — just in time for the new Phish album! Thanks to @PhishVids for the Twitter tip!